A little sick of all the tourists and annoying people at Giverny the day before, today we opt for the Marmottan. It’s in a lovely neighborhood in the 16 district. There’s a pretty peaceful park with lots of locals hanging out, children playing and a skateboarder. The Monets are in a nice room, all together and widely varied. “Nice room” does not include air conditioning, it should be noted. Other than the D’Orsay and supermarkets, we’ve yet to encounter any air conditioning in Paris at all. We note the differences and evolution of Monet’s work. Naturally, the water lilies are unbelievable (the French call water lilies, “nymphs,” an etymology that mystifies me.) I am especially impressed with his trees; I feel some of his works of buildings are slightly less fabulous. Of course with Monet, it is all fabulous, so I suppose it’s only nitpicking in slivers. I’m intrigued by how many layers of paint and glazing he uses, and also how frequently he does not paint to the edges of the canvas. My feet are killing me, so I debate about doing the last room. 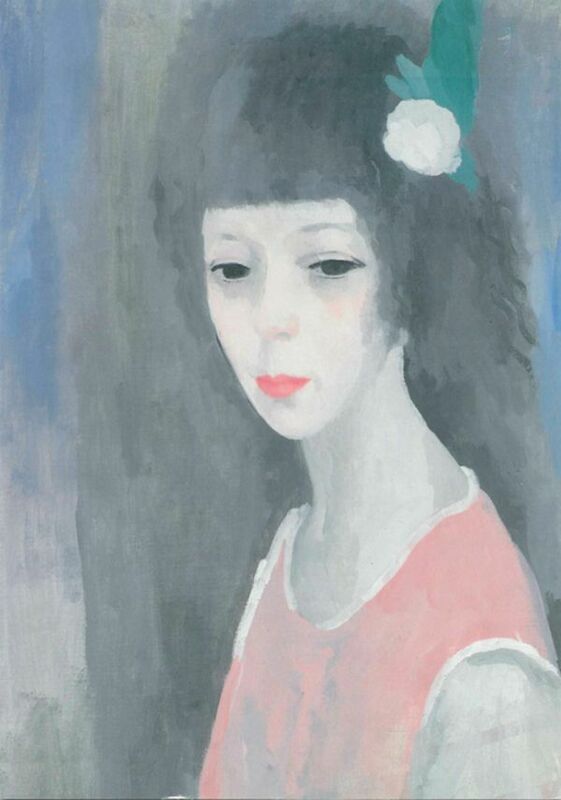 But I limp on down the stairs anyway to see the featured exhibit of Marie Laurencin, whom I’d never heard of before. As museums often do, the Marmottan has arranged her work in chronological order. The early work is interesting and impressionistic. I find her self-portraits compelling for their spirit and use of color. By her middle period, I am totally drawn in. Laurencin became more graphic and you can see the Art Deco influence on her work both in terms of line and color. My friend Amy keeps remarking about the eyes and how the faces are so simple yet so expressive. And then we got to her later work, which was around the corner. Museums use corners to great effect … transition but also surprise. I was already loving her work, but the later work was at a whole different level. Softer, richer and less definition between the subject and the background. Even more beautiful colors, and the influence of the 1940s and perhaps Gauguin could be seen. Suddenly, I feel goosebumps going up my spine and tears well in my eyes. So I sit on the viewing bench and linger, taking it in emotionally. Great works of art can’t be appreciated quickly. They speak to you if you slow down and listen. As someone who’s only recently begun painting, there is a special joy in Paris of being able to experience new artists for yourself. I don’t think you can ever truly get the artist’s work without seeing it in person. Scale, texture, color, glazing, layers … a book or internet photo can’t do them justice. Amy is just as impressed as I am, and as a gift, she buys me the exhibit book from the gift shop. Nice! As my friend Elaine suggested, we have lunch at Yamazaki. Our salads are quite good and the waitress is very sweet. She doesn’t speak a word of English, but I manage to find out what the giant, intriguing dessert is, with my limited French and unlimited hand gestures. Ice cream in a huge Jiffy-pop shape! We debate between that, a chocolate croissant and the spaghetti-chocolate cake thingie. I’m a little glad the waitress can’t understand the less-than-ritzy terms I’m using to describe their beautiful, delicate desserts to Amy, ha. When you’re in a strange land, clarity is at a premium!